A 2-year retrospective study of the treatment of retinal vein occlusion with dexamethasone 0.7 mg intravitreal implant (Ozurdex®): an emphasis on combination therapy. Introduction: Retinal Vein Occlusion (RVO) is the second commonest retinal vascular pathology after diabetic retinopathy. Ozurdex is a sustained-release 0.7 mg dexamethasone intravitreal implant which has been approved to treat adults with RVO, non-infectious posterior uveitis and pseudophakic patients with diabetic macular oedema. We aim to assess its efficacy and safety in a retrospective study which included 49 eyes of 46 consecutive patients over a 24-month follow up period. Methods: Data was collected retrospectively from paper and electronic patient records. Statistical analysis was performed using Microsoft Excel and SPSS. The paired student t- test was used to compare pre and post treatment data. Categories analysed included demographics, ocular and systemic co-morbidities, type of RVO, duration of macular edema prior to treatment, additional treatments with laser/anti-VEGF, pre and post treatment visual acuity, intraocular pressure, central macular thickness and complications. Results: Patients had equal gender distribution; age ranged between 42 to 91 years and the mean duration of macular oedema is 6.9 months (SD ± 9.24). Additional treatment: Laser PRP: Pretreatment: 16%, Post treatment: 22%. Anti VEGF: Pre-treatment: 6%, Post treatment: 42%. Number of Implants: 34.7% had 2 implants, 10.2% had 3 implants and 2.1% had 4 implants. Mean duration of repeat implant- 6.54 months (SD ±0.55). Mean reduction in CMT is 181.3μm (SD ± 210.92). The commonest complication at the end of the study was found to be high IOP in 26.5%. Visual outcome improved by > 15 letters in 32% at 2 months, 30% at 6 months and 28.5% at 2 years (p<0.061). Conclusion: This is a real-life data showing the effect of Ozurdex® in RVO. Our results are comparable with major studies like the Geneva study. Rates of complications were comparable. We show that combination therapy was superior to monotherapy. Dexamethasone 0.7 mg intravitreal implant (Ozurdex®); Retinal vein occlusion; Visual outcomes. Retinal vein occlusion (RVO) which includes branch retinal vein occlusion (BRVO) and central retinal vein occlusion (CRVO) is the second most common retinal vascular disorder after diabetic retinopathy. The prevalence of RVO is estimated to be 0.7-1.6% of the general population . Visual loss commonly occurs due to macular edema, macular ischemia and in more advanced cases due to vitreous hemorrhage and neovascularisation leading to glaucoma and blindness . Risk factors include hypertension, hypercholesterolemia, diabetes mellitus and glaucoma . Intravitreal steroid implants like Ozurdex is a form of treatment that is being used commonly for his condition and needs to be evaluated and monitored regularly . Other modalities of treatment include anti-VEGF (Ranibizumab, Aflibercept, and Bevacizumab), steroids (Triamcinolone) and laser photocoagulation . Ozurdex is a sustained-release 0.7 mg dexamethasone intravitreal implant. It has been approved to treat RVO,  non-infectious posterior segment uveitis,  and pseudophakic patients with DMO. It exhibits anti-inflammatory properties, reduce vascular permeability, stabilize endothelial cell tight junctions, and inhibit the synthesis of VEGF, prostaglandins, and other cytokines . Its pharmacokinetics enable high concentrations of dexamethasone to be sustained in the retina and vitreous during the first 2-3 months and lower concentrations are sustained up to 6 months . The potential side effects include an increase in intraocular pressure and cataract formation. However, the steroid response is predictable which peaks at 6 weeks and is effectively managed with drops . Ozurdex is preferred to anti-VEGF in patients with a recent history of myocardial infarction/stroke, pregnant women, vitrectomized eyes and those patients who prefer not to have frequent injections . We aim to assess the efficacy and safety of Ozurdex implant in 46 consecutive patients with retinal vein occlusion (a total of 49 eyes) over a 24 month follow up period. Primary outcome was the BCVA at 2 months, 6 months and 2 years and the secondary outcomes included CMT, mean duration of repeat injection, adverse effects and the benefit of combination therapy. This is a retrospective study that follows the declaration of Helsinki. We included 49 eyes of 46 consecutive patients diagnosed with retinal vein occlusion who were treated with Ozurdex intravitreal implant over a 17- month period between 01/08/2012 and 31/12/2013 at the Great Western Hospital Swindon UK. We excluded patients with ischaemic RVO and a patient who refused treatment. Our follow up regime included an intraocular pressure check at day 7 and subsequently 8 weekly depending on the response. Data was collected at 2 months, 6 months and 2 years. On each follow up visit we recorded the best corrected visual acuity (BCVA) using LogMAR, intraocular pressure measured (IOP) in millimetres of mercury using Goldman’s applanation tonometer, central macular thickness (CMT) in micrometres measured using Zeiss Cirrus Ocular Coherence Tomography (OCT) device and cataract was assessed by slit lamp examination. Fundus fluorescein angiography was performed in 30% of patients pre- injection and 6% post injection. Data were collected from patient records and analysed using Microsoft Excel spread sheets (Microsoft Excel 2010) and statistical analysis was performed using SPSS. Quantitative variables from the study groups and subgroups were analysed using the paired student t-test. Data collected included demographics, ocular and systemic comorbidities, type of RVO, duration of macular edema prior to treatment, additional treatments with laser/anti-VEGF (pre injection and post injection), number and dates of injections, BCVA, IOP, CMT at each visit and any complications following the treatment. We sub-analysed the group of patients that received only Ozurdex. Our study analysed 49 eyes of 46 patients who were treated with Ozurdex implant for macular edema secondary to retinal vein occlusion. 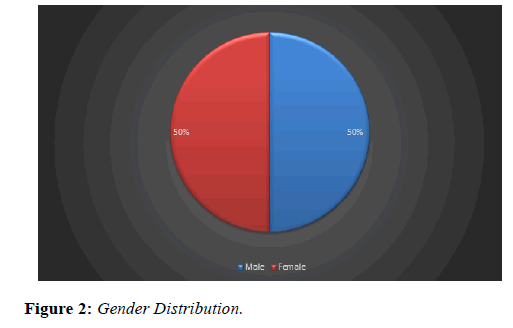 Age ranged between 42 to 91 years; mean age was 70.5 years (Figure 1) with an equal gender distribution of 50% males and 50% females (Figure 2). Duration of edema prior to treatment ranged from 1 week to 3 years. Mean duration was 6.9 (SD ± 9.24) months. 34.7% of the eyes received two implants over the study period, 10.2% received 3 implants and 2.1% received 4 implants (mean=2.3 implant/eye). Mean interval for repeating implant was 6.54 months (SD ± 0.55). 34.7% of the eyes received two implants over the study period, 10.2% received 3 implants and 2.1% received 4 implants (mean=2.3 implant/eye). Mean interval for repeating implant was 6.54 months (SD ± 0.55). 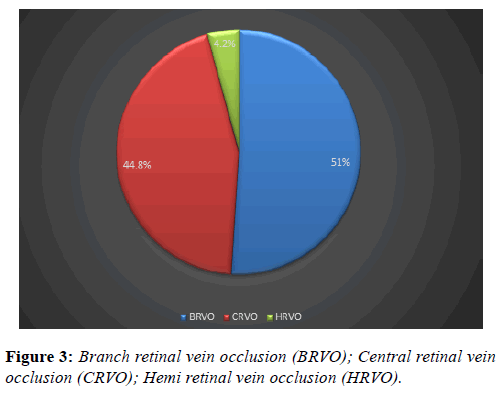 Branch retinal vein occlusion constituted 50% of the diagnosis, 46% for central retinal vein occlusion and 4% of the eyes had hemi retinal vein occlusion (Figure 3). Regarding ocular comorbidity (Table 1), 4% of the eyes had ocular hypertension and 2% had primary open angle glaucoma. Figure 3: Branch retinal vein occlusion (BRVO); Central retinal vein occlusion (CRVO); Hemi retinal vein occlusion (HRVO). Systemic co-morbidities (Table 2) include hypertension 60%, hypercholesterolemia 26%, diabetes 14%, ischemic heart disease 4%, hypothyroidism 4%, atrial fibrillation 2%, pulmonary embolism 2% and kidney transplant 2%. Pre-treatment with laser photocoagulation was in 16 % of the eyes and post treatment was in 22%, percentage of eyes pretreated with anti-vascular endothelial growth factor (anti- VEGF) was 6% and post treated were 42%. 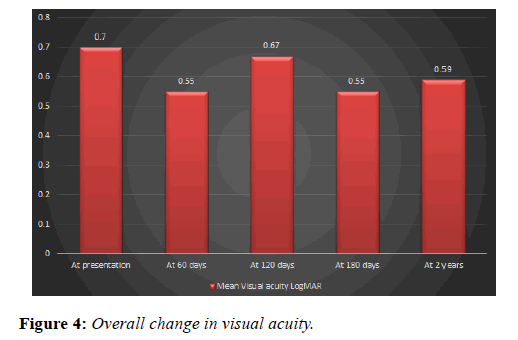 Mean visual acuity using LogMAR chart was 0.7 at presentation, post-treatment visual acuity was 0.55 (SD ± 0.31) at 2 months, 0.67 at 4 months (SD ± 0.37), 0.55 (SD ± 0.28) at 6 months and 0.59 (SD ± 0.40) at two years (Figure 4). Figure 4: Overall change in visual acuity. Percentage of eyes that gained 15 letters or more at 2 months post treatment was 32%, at 6 months was 30% and at two years was 28.5% (p value=0.061) (Table 3). Sub-analysis of the patients who received only Ozurdex showed that 15% gained >15 letters in 2 years (p value=0.235). Eyes that lost 15 letters or more at 2 months post treatment were 6%, at 6 months 14% and at two years 8.2%. Central macular thickness (CMT) at presentation ranged from 233 to 790 μm. The mean CMT was 513 μm (SD ± 137.20). Mean CMT at 2 months post treatment was 283.7 μm (SD ± 82.15), at 6 months was 371.8 μm (SD ± 152.76) and at 2 years was 332.5 μm (SD ± 174.50) (p value=0.0001). Mean change in CMT was -181.3 μm (SD ± 210.92) overall and -208.53 (SD ± 193.12) in the only Ozurdex group (p value=0.0001). The commonest complication at the end of the study was found to be high IOP in 26.5% overall and 21% in the only Ourdex group. All our patients were treated with pressure-lowering drops. Percentage of eyes with IOP above 21mmHg at 2 months was 6% and at 6 months was 30%, one patient ended up with IOP of 44 mmHg at 2 years. Percentage of patients who needed cataract surgery was 6%. Other complications recorded at day 7 post-treatment include extrusion of the implant 2.1%. Causes of visual loss among the study group were macular ischaemia, rubeotic glaucoma with vitreous haemorrhage, macular hole and epiretinal membrane. The National Institute for Health and Care Excellence (NICE) recommends Dexamethasone 0.7 mg intravitreal implant as an option for the treatment of macular oedema following central retinal vein occlusion (CRVO) and branch retinal vein occlusion (BRVO) when treatment with laser photocoagulation has not been beneficial or has not been considered because of the extent of macular haemorrhage . In our group of patients, the male to female ratio is 1:1, the age range is from 42 to 91 years. These demographics are similar in the gender distribution compared to a recent study  which looked into the efficacy and safety of intravitreal steroids for the management of retinal vein occlusion. The mean duration of CMO prior to therapy in our study was 6.9 months; this is because Ozurdex was a newly introduced method for the treatment of RVO at the time of initiation of this audit. The types of vein occlusion we found were as follows: 50% BRVO, 46% CRVO and 4% HRVO, in a similar study of a treatment naïve subgroup by Parvin et al. the distribution by diagnosis was closely similar to ours (46.2% BRVO and 53.8% CRVO), we noticed that many authors do not refer to HRVO as a separate diagnosis, it is sometimes included within the definition of BRVO. In the SHASTA study  the proportion of patients with OHT and glaucoma who were given treatment was significantly higher than in our group of patients (31.5% and 6%, respectively), this is because we deliberately tried to avoid including any patients with high intraocular pressure in the study because of safety reasons. The percentage of eyes pre-treated with anti-VEGF agent (Avastin) was 6% the reason for this was the lack of evidence to support anti-VEGF agents for treatment of RVO at the time when the study was conducted and that Dexamethasone implant was recognised as the first line of treatment of RVO . There was a much larger proportion of patients whose treatment was switched from Ozurdex to anti-VEGF agents (Ranibizumab), the main indication being a rise in the intraocular pressure (30% at 6 months) and this is compared to 20% from previous studies . The other reason for switching to anti-VEGF is lack of response in terms of gain in visual acuity or reduction in CMT. Recent evidence has shown that steroid responders can be continued to be treated with Ozurdex as the intraocular pressure is safely controlled by topical medication . Improvement in visual acuity by 15 letters or more is comparable to the results from the Geneva study,  where the percentages are 29% at 60 days and 22% at 180 days. Our follow up regimen resembles that in the Geneva study, and we also used an ETDRS LogMAR chart for testing the visual acuity. Mean reduction in central macular thickness (Figure 5) in our study is not very comparable to the reduction reported from a similar study by Singer et al. which was 195μm, possible reasons for that include the fact that there was no cut-off for the duration of CMO as part of the inclusion criteria in our study, which has an impact on the structural integrity of the macula  and consequently affecting the final response. Figure 5: Change in Central Macular Thickness (CMT). Limitation of the study is the small number of patients included. The presence of cataract is a confounding factor for visual acuity. In order to eliminate treatment bias we have analysed data from each treatment group separately. We conclude that combination therapy was superior to monotherapy and our results showed an Improvement of BCVA by >15 letters is 32% at 2 months, 30% at 6 months and 28.5% at 2 years. In the sub-group that received only Ozurdex, 15% of the patients had an improvement of BCVA >15 letters. Our results are consistent with the Geneva Study. The commonest complication encountered was high IOP, although a longer-term follow-up could have highlighted impact of other complications like cataract and secondary glaucoma. A comparison of outcomes in early intervention (<90 days) versus late intervention is recommended. Klein R, Klein BE, Moss SE, et al. The epidemiology of retinal vein occlusion: the Beaver Dam Study. Trans Am Ophthalmol Soc, 2000;98:133-41. Rehak J, Rehak M. Branch retinal vein occlusion: pathogenesis, visual prognosis, and treatment modalities. Curr Eye Res. 2008;33:111-31. Shahsuvaryan ML, Melkonyan AK. Central retinal vein occlusion risk profile: a case-control study. Eur J Ophthalmol. 2003;13: 445-52. Hoeraful H, Feltgen N, Wiess C, et al. Clinical safety and safety of Ranibizumab versus dexamethasone for retinal vein occlusion (COMRADE C): A European Label Study. Am J Ophthalmol. 2016;169:258-67. Ashraf M, Souka AAR, Singh RP. Central retinal vein occlusion: modifying current treatment protocols. Eye. 2016;30:505-514. Joshi L, Yaganti S, Gemenetzi M, et al. Dexamethasone implants in retinal vein occlusion: 12-month clinical effectiveness using repeat injections as-needed. Br J Ophthalmol. 2013;97(8):1040-45. Whitcup SM, Robinson MR. Development of a dexamethasone intravitreal implant for the treatment of noninfectious posterior segment uveitis. Ann N Y Acad Sci. 2015;1358:1-12. Nauck M, Karakiulakis G, Perruchoud AP, et al. Corticosteroids inhibit the expression of the vascular endothelial growth factor gene in human vascular smooth muscle cells. Eur J Pharmacol.1998;341(2-3): 309-15. Chang-Lin JE, Attar M, Acheampong AA. Pharmacokinetics and pharmacodynamics of a sustained-release dexamethasone intravitreal implant. Invest Ophthalmol Vis Sci. 2011;52:80-6. Bandello F, Parravano M, Cavallero E, et al. Prospective evaluation of morphological and functional changes after repeated intravitreal dexamethasone implant (Ozurdex®) for retinal vein occlusion. Ophthalmic Res. 2015;53:207-16. Chang-Lin JE, Burke JA, Peng Q, et al. Pharmacokinetics of a sustained-release dexamethasone intravitreal implant in vitrectomized and nonvitrectomized eyes. Invest Ophthalmol Vis Sci. 2011;52(7): 4605-9. National Institute of Clinical Excellence, "Guideline TA229," 2011. [Online]. Available: www.nice.org.uk/Guidance/ta229. [Accessed 12 April 2017]. Antonio Capone Jr., Michaela. Singer et al. Efficacy and safety of two or more Dexamethasone Intravitreal Implant Injections for treatment of Macular Oedema related to Retinal Vein Occlusion (SHASTA STUDY). Retina. 2014;34(2):342-51. Coscas G, Augustin A, Bandello F, et al. Retreatment with Ozurdex for macular edema secondary to retinal vein occlusion. Eur J Ophthalmol. 2014;24(1):1-9. Garweg JG, Zandi S. Retinal vein occlusion and the use of a dexamethasone intravitreal implant (Ozurdex®) in its treatment. Clin Exp Ophthalmol. 2016; 254: 1257–65. Haller JA, Bandello F, Belfort R, et al. Randomized, Sham-Controlled Trial of Dexamethasone Intravitreal Implant in Patients with Macular Edema Due to Retinal Vein Occlusion. Ophthalmology. 2010;117(6):1134-46. Singer MA, Tyler L, Jansen M, et al. Comparison of Anti-VEGF, Steroid, and Combination Therapy in the Treatment of Retinal Vein Occlusion. Int J Ophthalmic Res. 2016;2:133-6. Yeh WS, Haller JA, Lanzetta P, et al. Effect of the Duration of Macular Edema on Clinical Outcomes in Retinal Vein Occlusion Treated with Dexamethasone Intravitreal Implant. Ophthalmology. 2012;119(6):1190-8.